If that doesn’t work, then you’ll need to do some more troubleshooting. If you create a c:\flexlm folder, MatchMover will create the log files adlm.log and MatchMoverLicense.log in the c:\flexlm folder. If you see the errors [The product key was not found] and [The root information in Product Information Table XML file is missing], then see this post for more information on fixing the problem. A note about those MAYA env vars. You cannot override them by setting them before you start MatchMover. MatchMover appears to set them itself. For example, with ADSK_MATCHMOVER_LICENSE=3DSMAX, MAYA_LICENSE_METHOD comes from the registry key HKEY_LOCAL_MACHINE\SOFTWARE\Autodesk\3dsMax\14.0\MAX-1:409\ADLM\Type, where Type=2 is Standalone and Type=1 is Network. 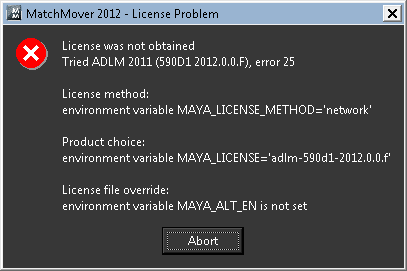 FLEXnet Licensing checkout error: License server system does not support this feature.